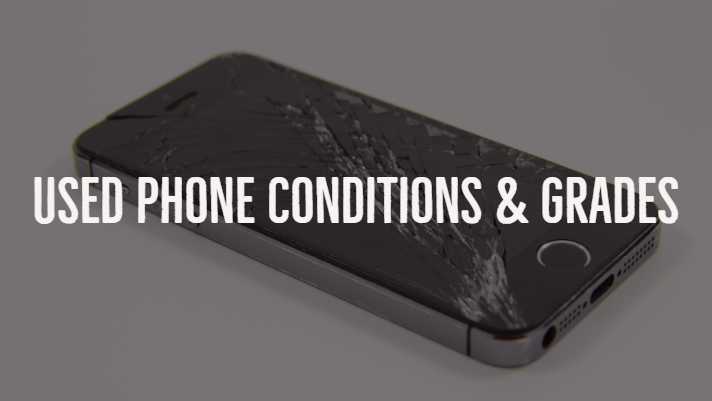 There are many codes and acronyms for used phone conditions but what do they all mean? some have become common industry-wide, we do things a little different but still are similar to other companies in how we track the quality of phones. We sum up our approach to conditions here we also have it below in this post. There isn’t exactly a definition to grades of phones that everyone agrees and uses but here is a quick overview of the most common we see and then we will touch on how Macalegin grades devices. Just about anywhere views this as top condition near mint devices. If you buy a grade A device expect it to be as close to new condition as possible but the price will also be the closest to regular retail as well. This condition doesn’t guarantee original parts (a screen may have been replaced for example) It’s good to think of this grade as “refurbished” or near mint. These devices are “good” they usually show normal wear like scratches or scuffs but an overall decent cosmetic condition. If you use your phone regularly for 6-12 months it will probably fall into B condition assuming you don’t drop it or damage it beyond normal wear. These appear heavily used and are “fair” in condition. They will work and function but nobody will think you are using a new phone. FRP Factory Reset Protection – This is an account lock preventing a user from being able to use the phone. Example: iCloud Lock, Samsung Reactivation Lock, Google Account Lock, McAfee. DIGI Digitizer – The section of glass over the LCD that registers user input through capacitive touch. IMEI International Mobile Equipment Identity – This is a unique number assigned to each device similar to that of a VIN number on a car. CDMA Code Division Multiple Access – Type of network protocol typically used in the US with carriers such as Verizon and Sprint. GSM Global System for Mobiles – Type of network protocol that is more globally excepted. AT&T and T-Mobile are carriers in the US that use this protocol. PGL, PFD, PFL, PBD, and PBL. Within each category, there are also subcategories that will give you more insight into the product. Each category and subcategory is color-coded and those colors are placed on our asset tags to ensure our devices have been graded and sorted properly. PGL Powers on has a good LCD and good glass. Most units are fully functional but are not fully tested. PFD Powers on has a good LCD with cracked glass. The touch screen still functions. PFL Powers on, has good glass with an LCD that has minor faults such as small amounts of water damage, burn-in, minor backlight issues, or hotspots. PBL Powers on and has a damaged LCD such as severe water damage, hotspots, LCD bleed, bad backlight or no display. The glass may or may not be intact. PBD Powers on and has a good LCD but a portion or all of the digitizer does not work properly. IMEI We checked the IMEI on the phone and it is not able to be activated on its original carrier or is still under carrier financing or blocked for use with that carrier. AL FRP is enabled on the device. In its current state, it cannot be activated by any carrier. NB Device uses an external battery but does not have one included. It may or may not have a battery door. ID Device has a fingerprint sensor that is not functioning properly. This is our highest grade of product which receives the most extensive level of testing. PGL units have a fully functional screen. They are tested for good LCD, digitizer, cracked glass, image burn, color delamination, volume buttons, power buttons, and charge ports. Although we do not test for full functionality, the list above gives us a ratio of over 85% fully functional units. WHAT CONSTITUTES AN RMA FOR A PGL DEVICE? Unit boot loops or never fully boots. The unit has FRP enabled where it was not indicated. WHAT DOES NOT CONSTITUTE AN RMA FOR A PGL DEVICE? Unit housing with a minor crack. Units with minor imperfections or cracks are considered good. Unit housing with a minor bend. Units with a slight bend are considered good. We will not send out units with severe cracks, bends, or units where a crack or bend affects functionality. A minor burn-in only noticeable on a white screen. A slight burn-in defect will be considered PGL. An LCD with two or less hot spots. Minor discoloration or light shadowing only visible on a white screen. Pitting to the exterior corners of the glass. Cracks or missing glass on the back housing of the phone. Crack to the camera plastic cover on the back. Cosmetic wear to the buttons. All units will contain buttons but will vary in the cosmetics. Custom ROM’s, firmware, jailbroken or rooted devices. Devices that have a bad ESN/IMEI unless sold as verified good. PFD product powers on with a good LCD. The glass is either cracked or has delamination or air pockets between the glass and LCD. Some units may also have very light image burn. We do not test other functionality although most devices only need the glass replaced. WHAT CONSTITUTES AN RMA FOR A PFD DEVICE? WHAT DOES NOT CONSTITUTE AN RMA FOR A PFD DEVICE? PFL product powers on with an LCD that has either image burn-in, or hot spots on a white screen. The glass is not cracked or delaminating. We do not test other functionality although most will have full functionality. WHAT CONSTITUTES AN RMA FOR A PFL DEVICE? WHAT DOES NOT CONSTITUTE AN RMA FOR A PFL DEVICE? PBL product has either a broken LCD with no display or has what we call a “double whammy”. This is a device with broken or delaminating glass and image burn. In most cases the LCD is still visible but because it fails in 2 categories we consider it to be a PBLunit. WHAT CONSTITUTES AN RMA FOR A PBL DEVICE? WHAT DOES NOT CONSTITUTE AN RMA FOR A PBL DEVICE? PBD product powers on with a visibly good LCD. The digitizer either has no function or partial function. Glass may or may not be cracked or delaminating. WHAT CONSTITUTES AN RMA FOR A PBD DEVICE? WHAT DOES NOT CONSTITUTE AN RMA FOR A PBD DEVICE? So what does it all mean Macalegin vs everyone else? We track and mark issues by using our conditions, we only screen devices up until PGL quality which contains a mixture of mostly A, B and some C devices. Our customers enjoy the savings they get on quality devices by paying PGL prices for often higher quality devices.